Vacuum cleaners are cleaning machines that use suction to collect dirt, dust, waste products from industrial processes, and other kinds of debris for disposal, recycling, or reuse. In many bulk material handling settings, some materials are lost during processing or transfer. An industrial vacuum cleaner can be used to clean up these materials and even reclaim them for processing at another time. Excess bulk solids can build up quickly in a busy industrial facility, so a strong high-capacity vacuum cleaner is the best way to keep things clean. Vacuuming also eliminates dust and other harmful toxins that may be present in the air and hazardous to human health. Industrial vacuums come in many types and can be configured to almost any type of media; from wet to dry bulk materials and more. In some cases where contamination is not a concern, these materials can be gathered up and entered into the bulk material handling system again. This reduces waste and improves the overall efficiency of the process. More advanced industrial vacuums are built with HEPA filters so that both large and small particles can be removed from a facility. Essentially, a vacuum is an area from which air has been removed. This drastic reduction in pressure causes the more highly pressurized air surrounding the vacuum to rush into it with great force. Vacuum cleaners are able to create an artificial vacuum with low air pressure in order to collect debris. All vacuums cleaners are configured differently and some create lower pressure than others. However, in all vacuum cleaners the same basic principle applies and dust or dirt is quickly drawn in. There are several different types of industrial vacuum cleaners that can be used in bulk material handling systems: continuous bagging vacuum cleaners, air powered vacuum cleaners, and continuous duty vacuum cleaners. Continuous bagging vacuum cleaners are designed to deal with dusty debris. These systems are equipped with closed bags that capture and confine dust so that it does not spread through a facility. The vacuum can run continuously to capture particles as bulk materials are being conveyed or processed. Air powered vacuum cleaners make use of forced air to gather materials. The do not require electricity or generate heat, so they are very safe to operate in a facility that handles hazardous materials. Finally, continuous duty vacuum cleaners are built to work around the clock in tough environments where constant vacuuming is a necessity. Continuous duty vacuums are usually used when material recovery is a priority since they can operate for as long as all of the other equipment is running. In small to medium sized bulk material handling operations, industrial vacuum cleaners may be portable so that they can be moved throughout the facility as needed. 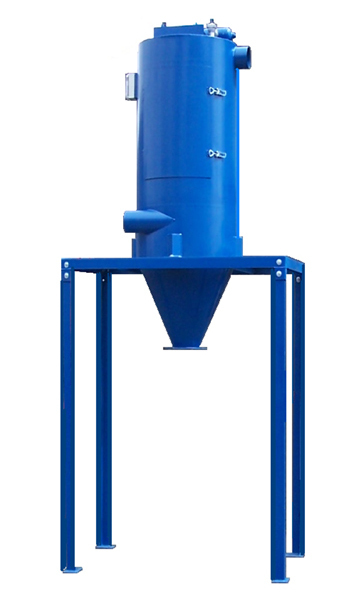 In larger bulk material handling facilities, the vacuum may be placed in a stationary position somewhere in the production line, or there may be several vacuum units to capture all of the dust and debris. 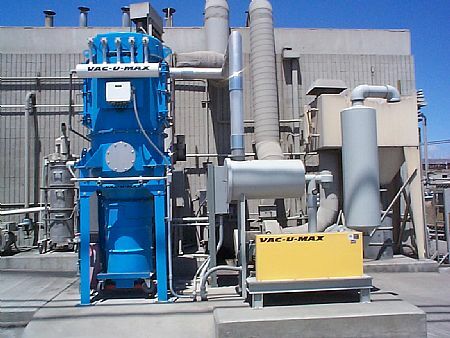 Central vacuum cleaning systems are also an option for some bulk material handling facilities. These systems have a central chamber that is connected to various outlets in the facility via ductwork. Hoses can be moved around and inserted into the outlets which then transport the debris to the chamber. The container of a central vacuum system can be emptied periodically and stored out of sight for a more efficient use of space. Vacuum Cleaners Vacuum cleaners are cleaning machines that use suction to collect dirt, dust, waste products from industrial processes, and other kinds of debris for disposal, recycling, or reuse.